MARK: It’s hard to define what it means to be a “good friend.” Here’s one manifestation of it. Kurt Young Binter, a dear friend since high school and the best man at my wedding 30 years ago, woke up at his home in Milwaukee at 3 a.m. today. He threw his bike into the back of his car. He drove 3 and a half hours into the heart of Illinois. 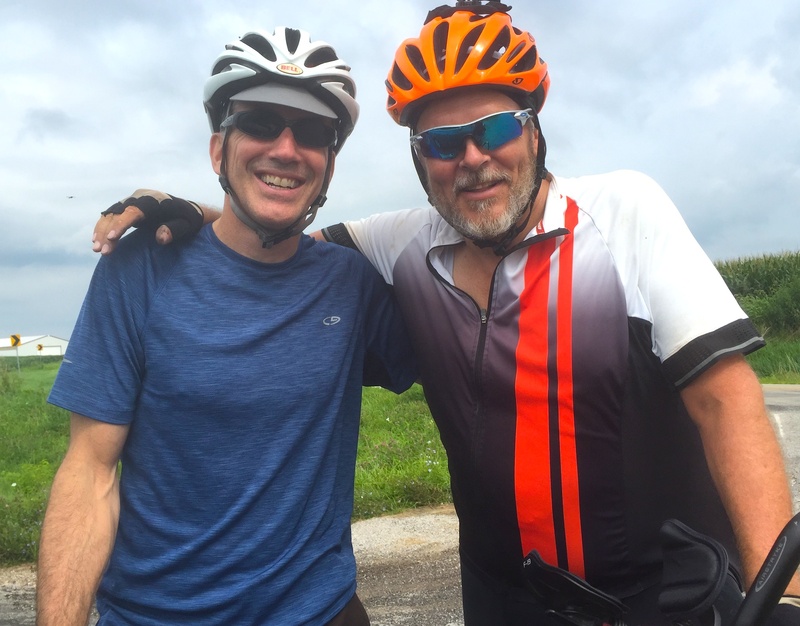 He parked and rode his bike to intercept me while I was chugging along into a steady headwind on my way to Kewanee. (Read more about the surprise here on Mark’s blog). MELODY: Of course I was in on the secret so I was prepared to capture the surprise on video. Here is the moment Kurt was waiting on the side of the road acting like a lost cyclist when Mark rides by. Enjoy! (Warning: profanity is involved). I was so happy the surprise worked out! It was definitely a highlight for me (and Mark!) on this x-country trip that started back in June. Mark writes about it on his blog about what it was like from his perspective and the meaning of friendship. Be sure to check it out here. I have more stories to tell about some of the interesting people we have met the past few days, but I will write about them tomorrow. Gotta go catch up with Mark now! PS: We are also posting on Facebook if you want to follow us there.